Sport&Health. We’re here to help. Regardless of your goal or fitness level, we have a class for you. Meet new people. Learn new moves. And enjoy the support and accountability that comes with exercising as a group. Work out smarter, not harder. Real results require variety in pace, style and effort. And we'll show you how! 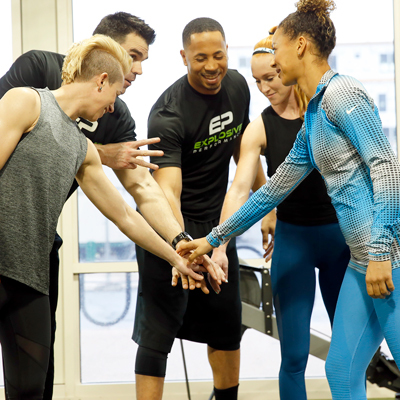 Our team of nationally-certified personal trainers will tailor a safe, fun, effective fitness plan to your individual fitness needs. 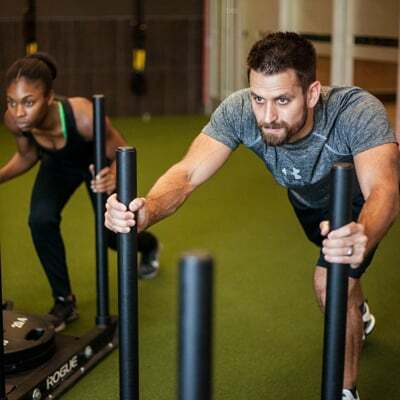 Whether you’re an athlete, former athlete, or just want to train like one, we’ll help you up your game! Train for speed, agility and quickness. Improve your reaction time and leaping ability. the ultimate workout combining intervals of cardio and functional training movements in a fun and motivating group setting, designed to help you burn 500-1000 calories in one session! Work out smarter, not harder. Real results require variety in pace, style and effort. And we'll show you how! Our team of nationally-certified personal trainers will tailor a safe, fun, effective fitness plan to your individual fitness needs. More efficient workouts mean faster results! “Great facility with all the equipment you need and also friendly staff. This combination promotes a healthy environment for everyone trying to get in shape." “The best club for individual training, group exercise and family fun!" Whether you’re an athlete, former athlete, or just want to train like one, we’ll help you up your game! Train for speed, agility and quickness. Improve your reaction time and leaping ability. And build the critical strength and flexibility needed to prevent common sports-related injuries. “There's something for everyone at Sport&Health. A big sized pool, squash courts, basketball courts, weight lifting, plenty of classes, and tons of new cardio equipment." Dive into an exciting new lifestyle of refreshing fun and fitness! We offer swimming lessons, aqua aerobics, swim teams, family swim, U.S. Masters Swimming and much more. It's never too soon or too late to hit the water! “From the front desk staff to the cleaning team, one always feels welcome at Sport and Health." Transform the way your body looks, feels and performs with Pilates and Yoga programs! Build a long, lean, muscularly-toned body using proven body-weight and flexibility exercises. Whether managing stress or sculpting a better body, we've got the mind/body solution for you! “This gym has an ambience of friendliness and welcome behavior. It is a great place to come to let stress out during the day or night time." “There is so much good energy in this place. It makes me extremely excited and proud to be a member of the Sport&Health team." Welcome to our Sport&Health Kid's Club. We are proud of our facility, and our Kid's Club playroom. It is our mission to provide quality childcare in a safe, sanitary, and welcoming environment while you enjoy the full benefits of our workout facility. “ll the staff are very friendly and attentive. And if you have kids under the age of 9, the Kidz Club here is hands down the BEST!" At Sport&Health, we pride ourselves on providing the Ultimate Fitness Experience to every member every time. With that goal in mind, we've built the nicest health clubs in the industry to offer the best in health and fitness to everybody. Whether you are brand new to fitness or are training for your next triathlon, we offer the facilities you need to achieve the goals you want! “Fellow members are friendly, facilities are clean, and there's a great variety of equipment and machines. I love that this is my neighborhood gym."